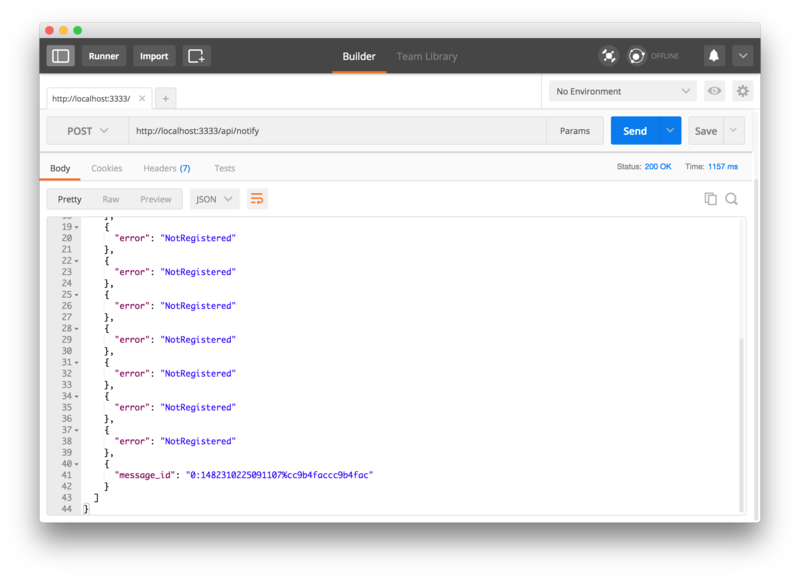 Learn how to build, configure, and send push notifications from your web application, and how to use Postman to automate the process. In Introduction to Progressive Web Apps (Offline First), we discussed what a typical progressive web application should look like and also introduced the service worker. We also cached the application shell. In Introduction to Progressive Web Apps (Instant Loading), we made the app cache dynamic data and load instantly from locally saved data. 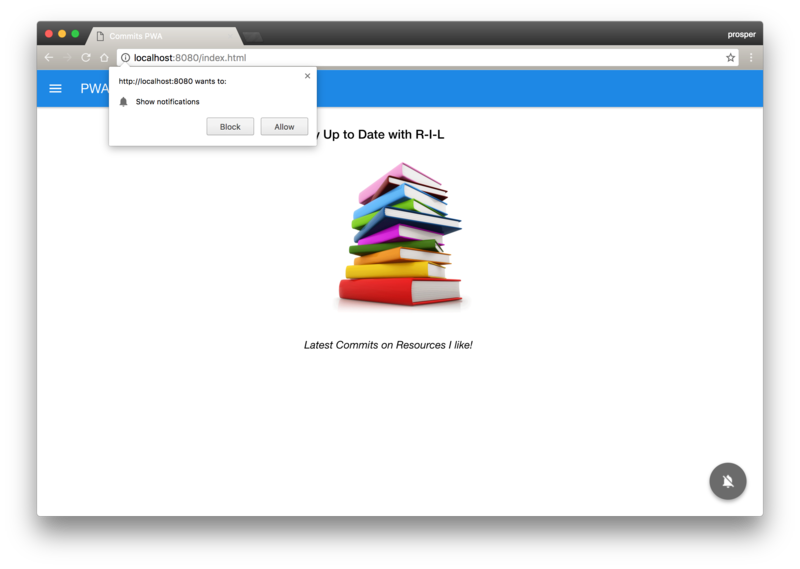 Activating Push Notifications in the web app. 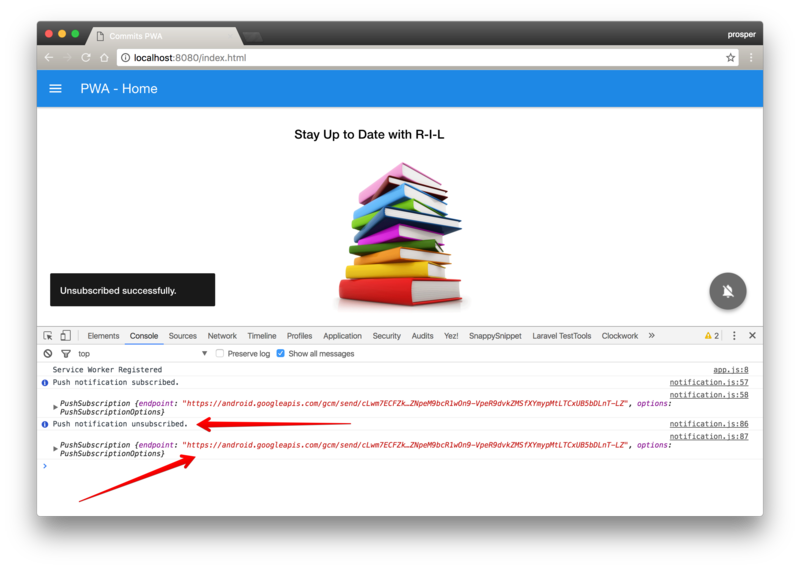 Adding a web application manifest to make the web app installable. The user's subscription ID is used whenever messages are posted from the server. 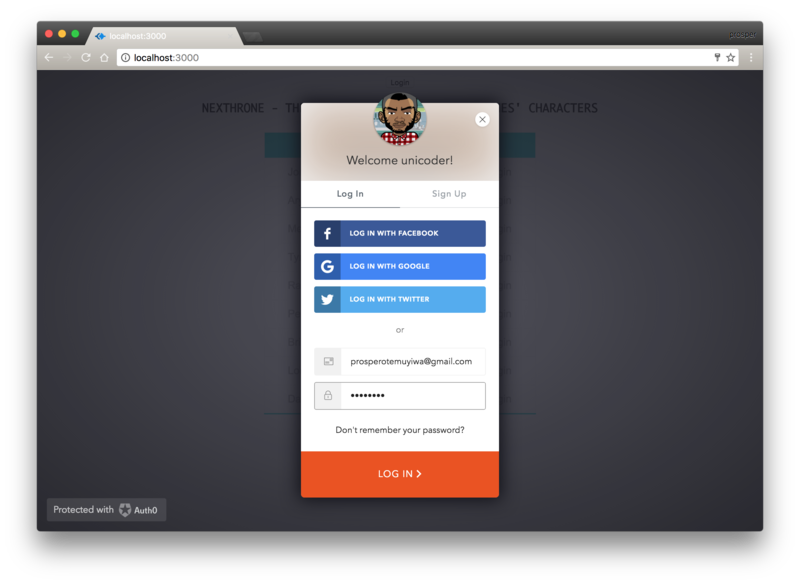 Every user can actually have a customized experience based on their subscription ID. 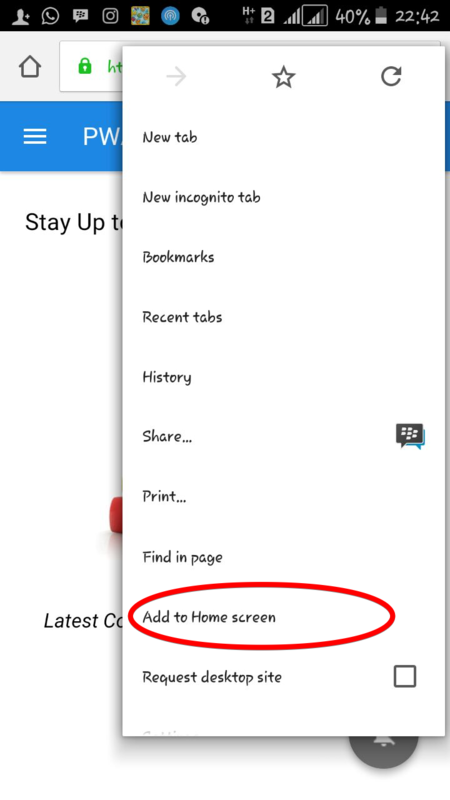 Give the user an option to click on a button to activate or deactivate push notifications. 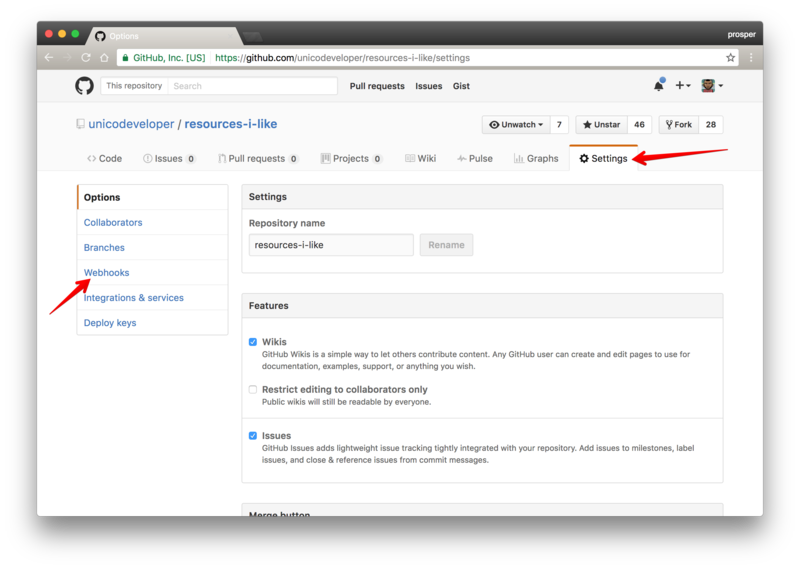 If the user activates, subscribe the user to receive push notifications via the service worker's push manager. Set up an API to handle saving and deleting of users subscription ID. This API will also have endpoints that will be responsible for sending notifications to all the users that have activated push notifications. 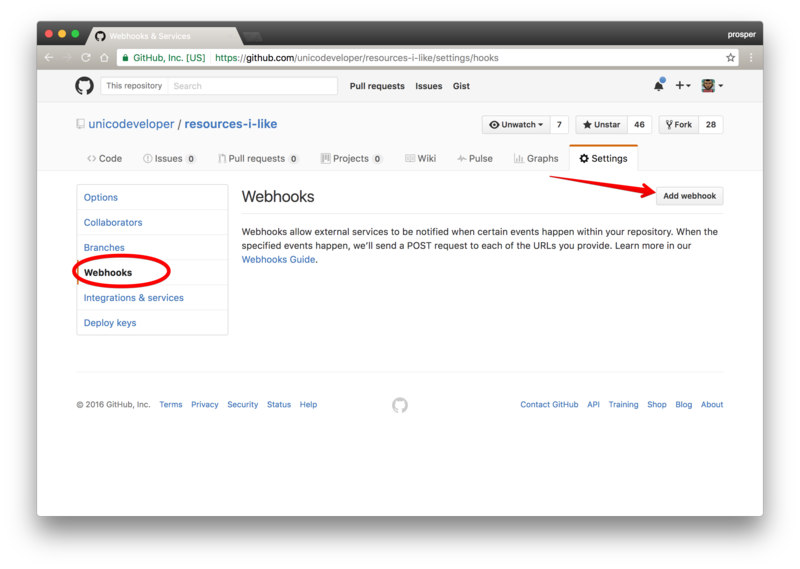 Set up GitHub Webhook to automate the sending of notifications immediately when a new commit is pushed to the resources-i-like repo. 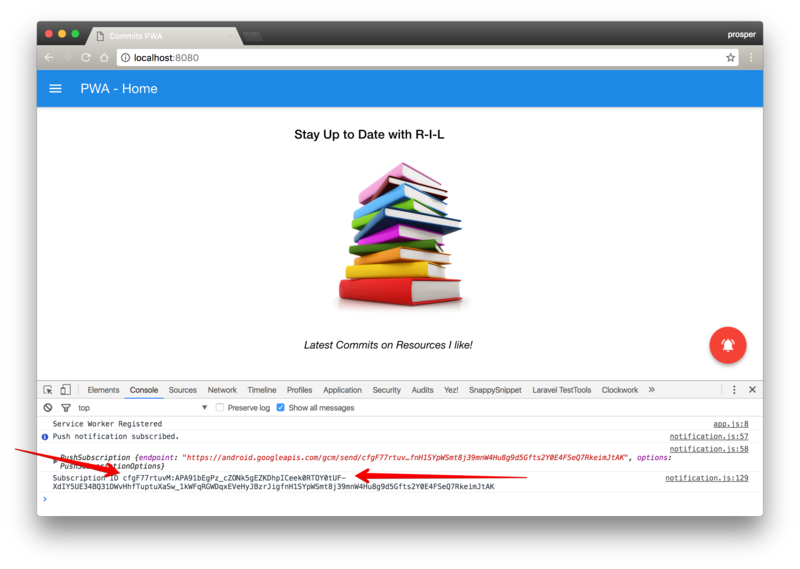 This code checks the browser to determine whether push notifications are supported. Now, it's paramount that the service worker has to be registered and ready before you can even try to subscribe a user to receive push notifications. So, the code above also checks if the service worker is ready and gets the subscription of the user. 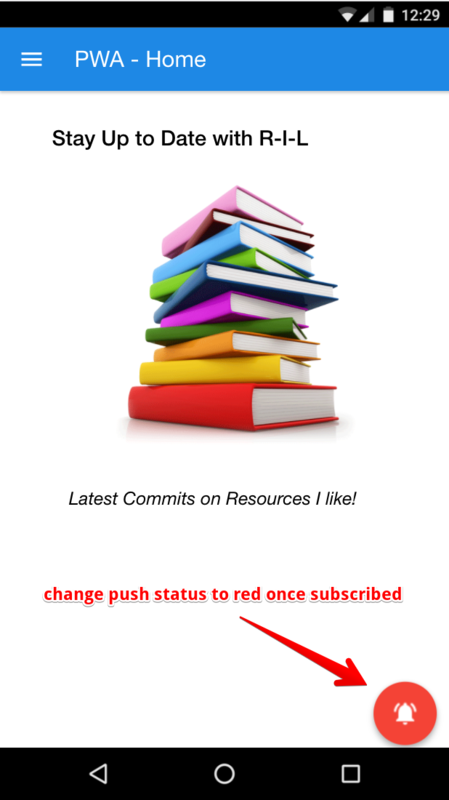 The changePushStatus function simply changes the color of the button to indicate whether the user has subscribed or not. This code is responsible for unsubscribing from push notifications. A toast message indicates the unsubscription, then goes ahead to change the color of the button and delete the subscription ID. Note: The function that deletes the subscription ID has been commented out for now. POST /api/users to create new users and store their subscription IDs. DELETE /api/user/:user_id to delete and unsubscribe users. POST /api/notify to send notifications to all subscribed users. Note: With this good tutorial, you can see how the API service should be set up. 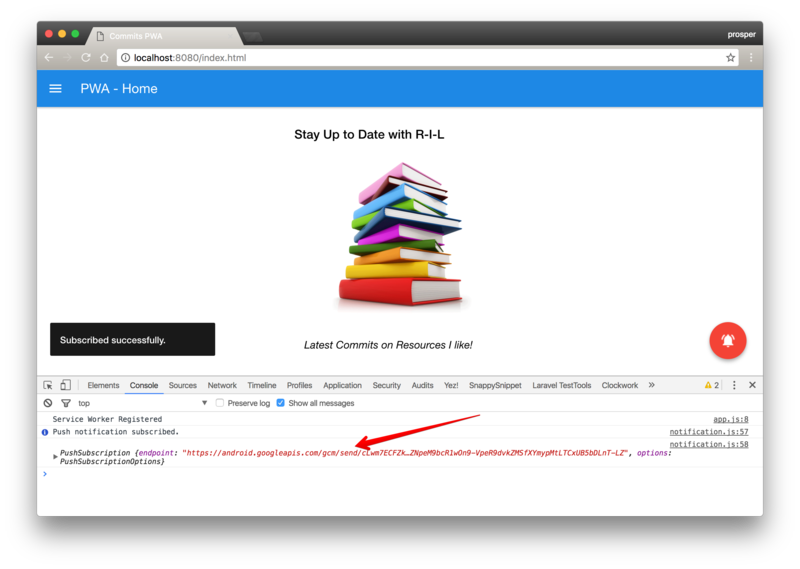 I simply implemented a node.js version of the API service in this tutorial. Don't fret! The reason why we are encountering this issue is that we don't have a manifest.json file in our web app yet. 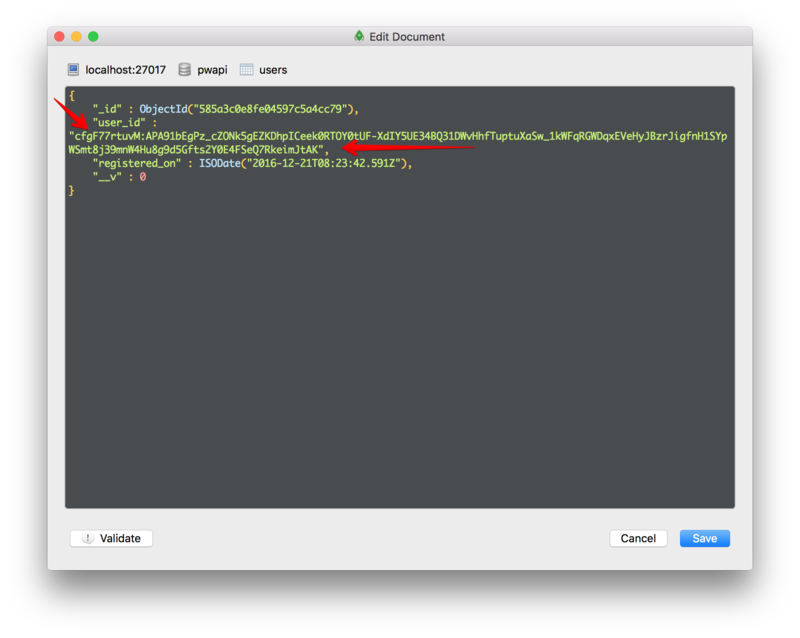 Now, the interesting thing here is this: Creating a manifest.json file will solve this challenge and add another feature to our app. With a manifest.json file, we'll be able to add our app to a user's device's home screen and make the app installable. Viola! icons: represents the applications' icon set for the home screen, splash screen, and task switcher. 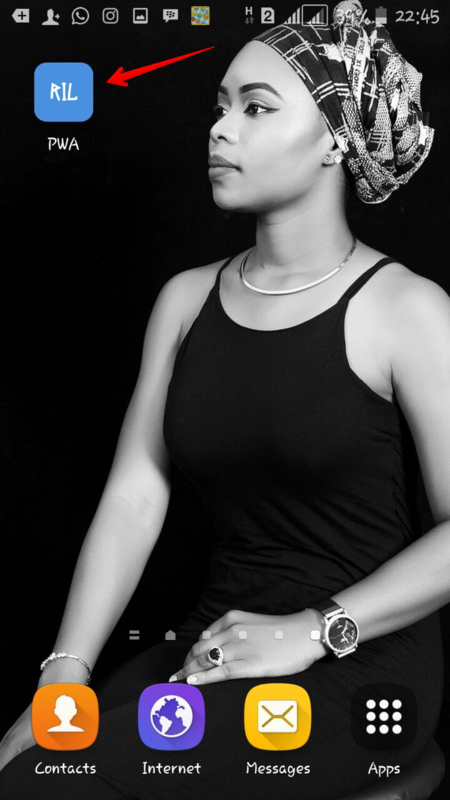 author: is a custom key that represents the author of the app. gcm_sender_id: represents the sender_id from Firebase Cloud messaging that is used to identify the application. Replace the sender_id value here with the one from your dashboard. You can see that the subscription IDs are the same, meaning our file got posted and saved in the API service database. Here, the code above listens to the event that is fired when a user clicks on the notification. event.notification.close() closes the notification once clicked. Then, a new window or tab will be opened, re-directing you to localhost:8080/latest.html. Note: event.waitUntil() is called to ensure the browser doesn't terminate our service worker before our new window has been displayed. Now, it's time to add a hook. The hook will be our notify API endpoint. 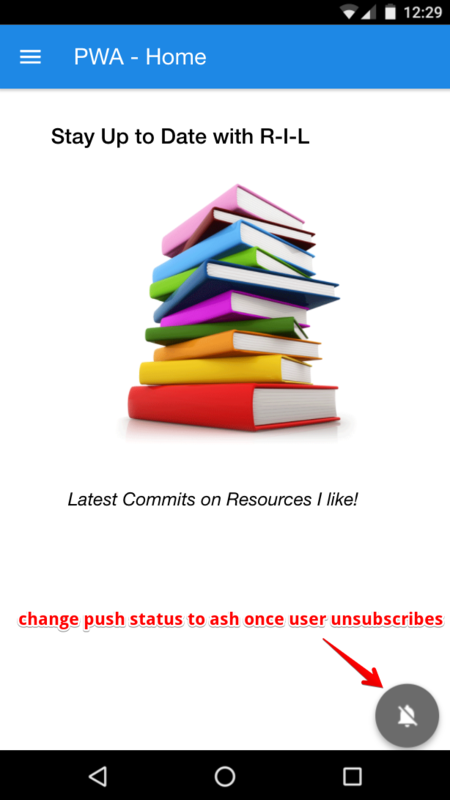 When you make a commit on GitHub, a push event is fired. 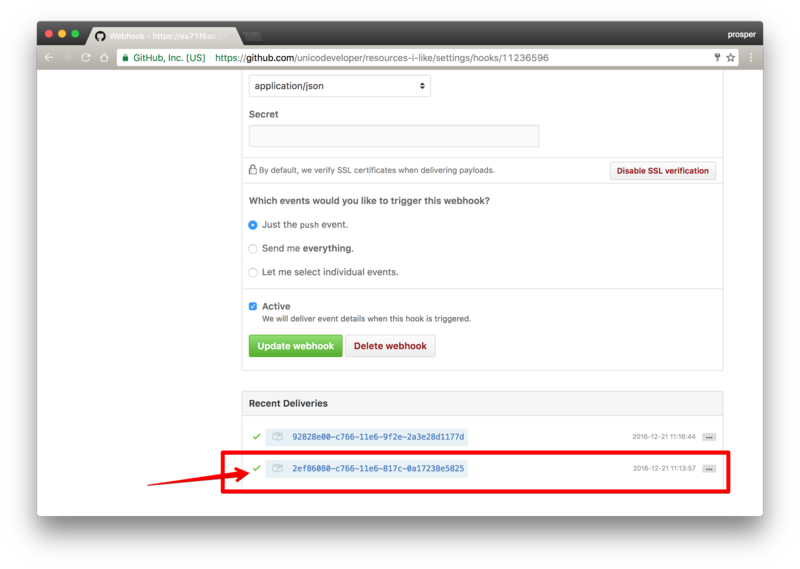 With this webhook, a POST request will be sent to /api/notify API endpoint whenever a commit is made to this particular repository. Sweet! 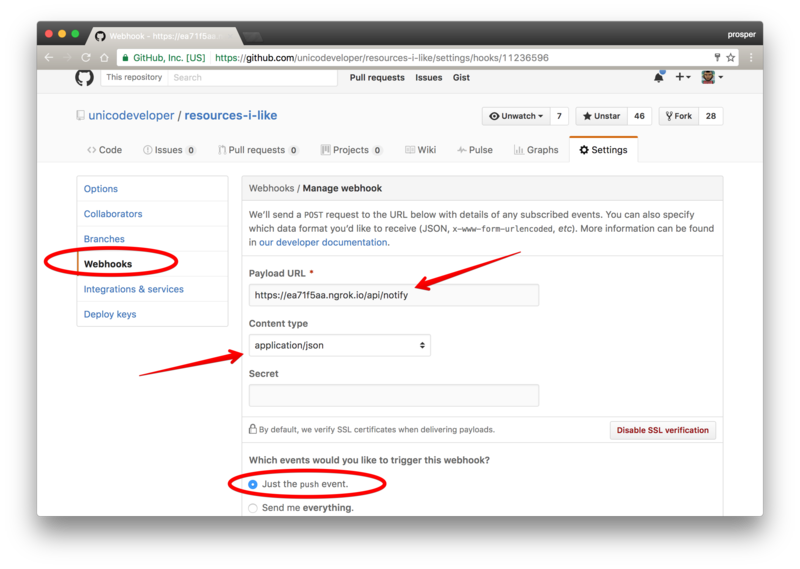 Now, once you have added the webhook, GitHub immediately does a test POSTping to the hook to determine if it is all properly set up. Yes! The process has been totally automated. In the case of an offline-first app, authenticating the user against a remote database won't be possible when network connectivity is lost. However, with service workers, you have full control over which pages and scripts are loaded when the user is offline. This means you can configure your offline.html file to display a useful message stating the user needs to regain connectivity to log in again instead of displaying the Lock login screen. Progressive Web Apps have a checklist. I highlighted the requirements in Part 1. However, there is a tool, Lighthouse for auditing an app for progressive web app features. 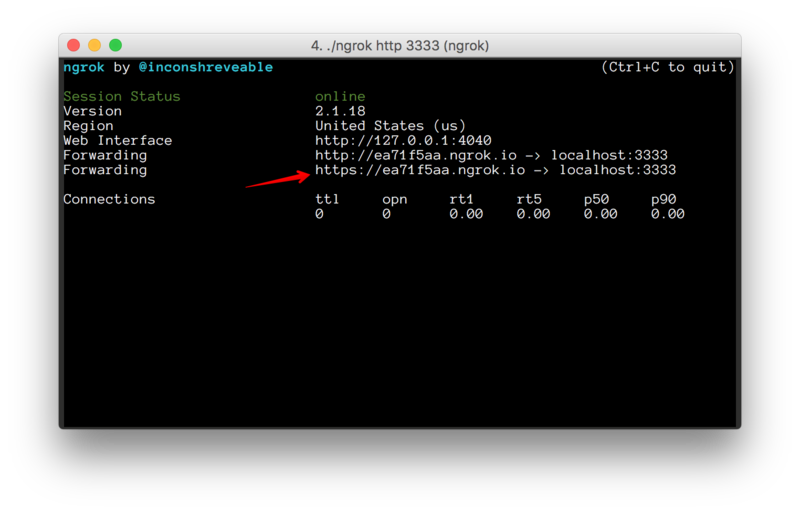 It is available as a Chrome extension and also a CLI. I recommend that you use this tool frequently when developing a progressive web app. 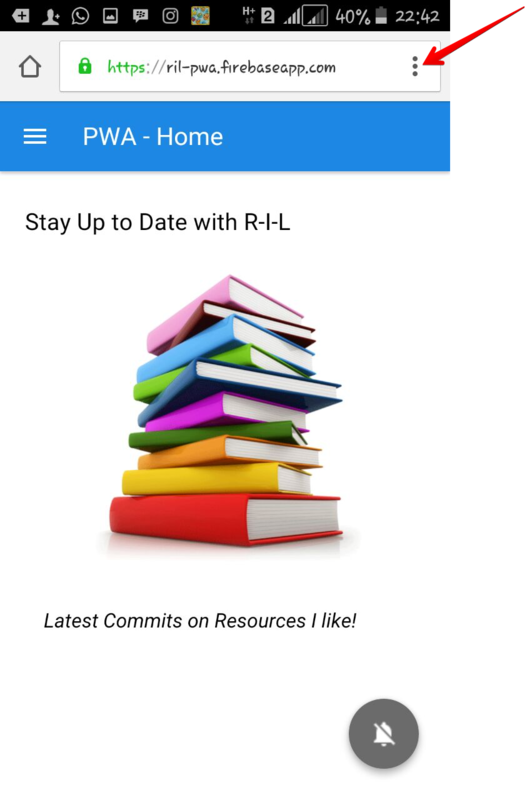 This tutorial wouldn't have been possible without Ire's series on PWA, Timi's server side push notification tutorial, Gokulakrishnan's PWA demo app, and the guys at Google that work and blog daily about progressive web apps. Thanks a bunch! 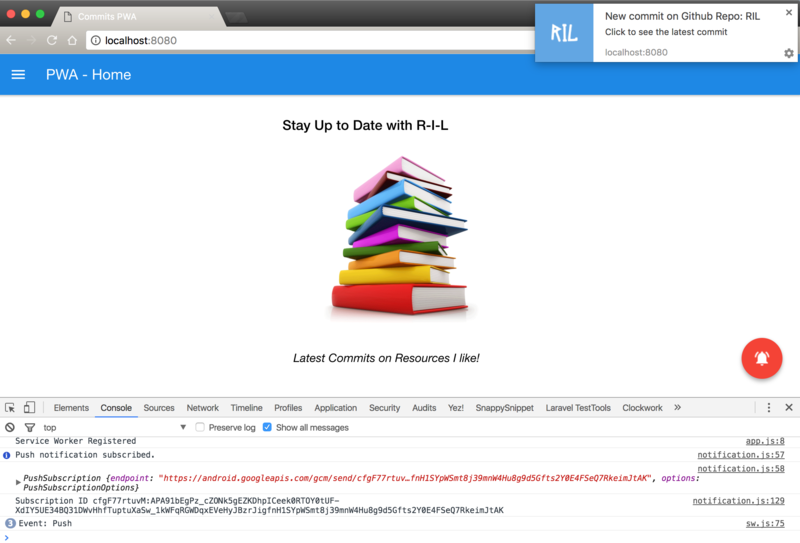 Hopefully, you're now ready to dive fully into making your web applications progressive! Progressive Web Apps: Are They Enterprise-Ready?